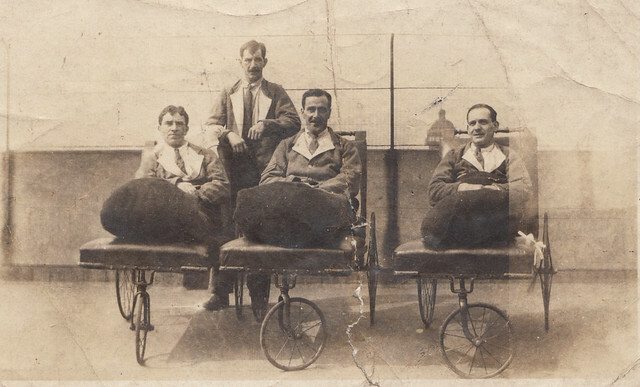 The city of Brighton became an important hub for the treatment of wounded during the Great War. In 1914 the Brighton Pavilion had been famously used to treat Indian Army wounded and sick, with those who died being cremated on the Sussex Downs where the Chattri now stands. 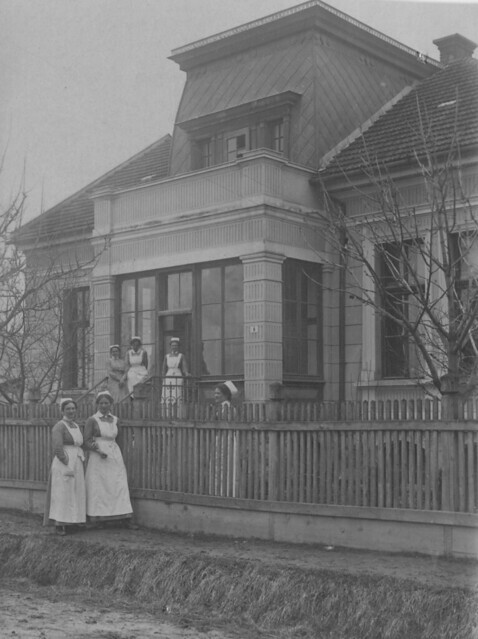 Many other buildings – including large houses and schools – were also pressed into use and they operated as part of the Eastern Command chain of medical facilities. 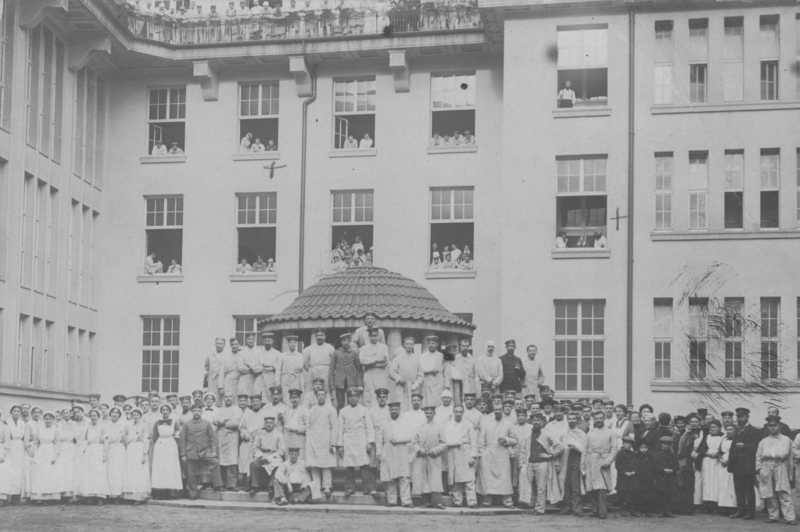 This image shows one of the Brighton hospitals in the early years of the war with nursing personnel looking after the patients. 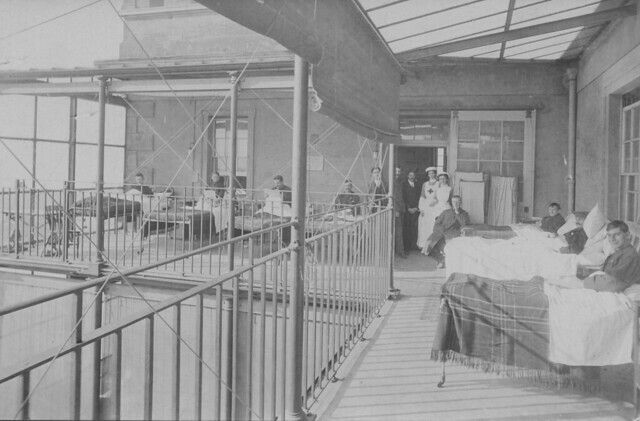 The photo gives a clear insight into how these facilities could easily be overwhelmed after a major operation on the Western Front as here there are so many patients many of them are now in impromptu wards on the balconies of the hospital. No doubt it was considered the sea air would aid in the recovery of the men! Special screens are up to reduce the brightness and all the beds are on wheels so the men could be moved inside when it rained. 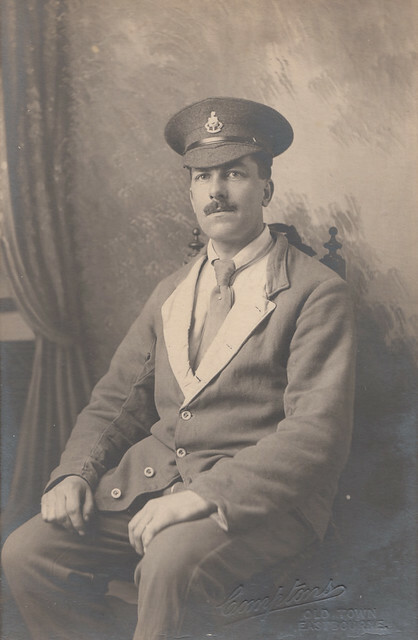 This soldier of the Royal Sussex Regiment was photographed in Eastbourne sometime in 1916. He is wearing a style of uniform that became very symbolic of the Great War: Hospital Blues. A form of hospital uniform had been introduced even before the Boer War but in the early years of the Great War the need to ensure that convalescing soldiers had a uniform they could wear in public became quite important; if they stepped out in civilian clothes there was always the risk they might attract the attention of zealous patriots who went round handing out white feathers to men not in uniform whom they suspected were not doing their ‘bit’ for King and Country. The Hospital Blues uniform was therefore available for convalescing troops in Britain; some were issued for France, but the emphasis on issue was on the Home Front because of the problems of interaction with the public. It consisted of a white shirt, a bright red woven tie and a blue jacket; all of which can be seen in this image. As is visible here the soldier also wore his Service Dress cap with regimental insignia; where no cap was available, soldiers often wore their regimental badge on their lapel. The uniform was worn with pride as it showed that not only was the man in the armed services, he had served overseas and been wounded. The fact that this photograph was taken in Eastbourne may also indicate the unknown soldier here may have been a patient in Summerdown Camp; constructed on the high ground above the town, it was one of the largest convalescent hospitals in Sussex during the Great War, and photographs of it will feature in a future posting.